HomeEvent FeatureA Day & Night at the Opry in Nashville, Tennessee, U.S.A. The Grand Ole Opry is legendary. It started out as a simple radio show back in 1925 that has evolved into an entertainment operation that launched country music into the stratosphere. The Grand Ole Opry is the longest running radio show ever. It showcases a mix of classic and up-and-coming country stars. Sarah Darling, Michael Ray and Riders In The Sky on the hallowed stage. 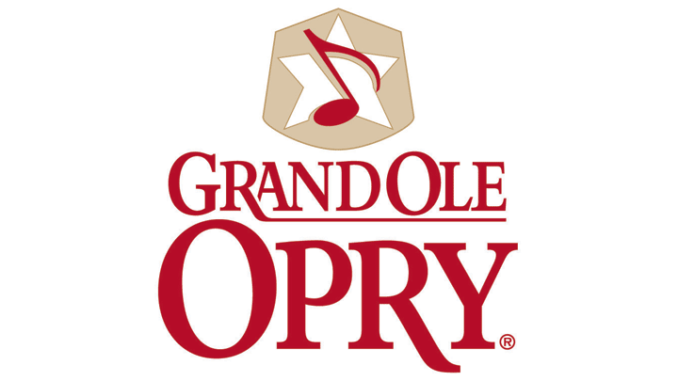 The Grand Ole Opry is located at 2804 Opryland Drive in Nashville, Tennessee. The building serves as both a museum as well as a venue for concerts including the Grand Ole Opry radio shows that are broadcast live several times a week. On May 26, 2015 we spent a day & night at the Opry. 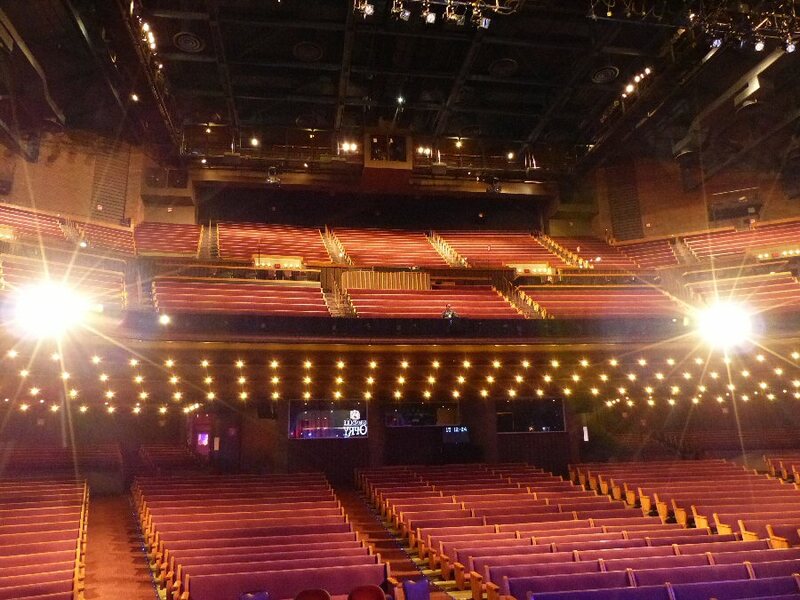 The theater offers a number of options such as “Behind the Opry Curtain” a tour that allows a select group of fans to be backstage moments before the radio show starts and on stage during the first performance of the night before being personally escorted back to their seats. “Post-Show” is an exclusive look at what happens right afterwards. Lastly, the “Daytime” tour is an informative behind-the-scenes look at the Opry, which includes a walk across that hallowed stage. Tuesday afternoon we took the “Daytime” tour with video host Blake Shelton. He shared a brief history of the Opry along with some information about its early stars such as Minnie Pearl “the Queen of country comedy.” Blake via video guided us through the Ryman years then into the 1970’s when the Opry moved to its current location. Yet, the Ryman roots are honored as the Opry kept the pew seating intact just like their former home has. On the Opry stage is a round circle that was cut out from the floorboards from the original venue. Connie Smith, Dustin Lynch and the Swon Brothers at the Opry. Shelton’s narration and film clips were woven into the “Daytime” tour. We watched the footage showing a surprised Shelton receive his invite to join the Opry – one of country music’s highest honors. Blake shared that getting your name on the Opry wall (which you see on the tour) means you made it. The invites are at the discretion of management and there are obligations that come with it such as the requirement to perform at the Opry a certain number of times per year. We saw the artist’s entrance where every Opry performer has walked through. The pathway has plants that look like stars and it has been dubbed the “star walk.” We peered into the themed dressing rooms and got to hang out in the green room where the artists wait before taking the stage. On the wall of the green room is the four foot flood line mark left by the Cumberland River in 2010. The water damage was devastating but the circle of country music cannot easily be broken as people worked 24 hours a day for four months to restore the Grand Ole Opry to the beautiful modern facility that it is. Also, not one radio show was missed as they were hosted at other venues throughout the city of Nashville. The “Daytime” tour was educational and exhilarating – when one thinks about all the country stars who have performed here. 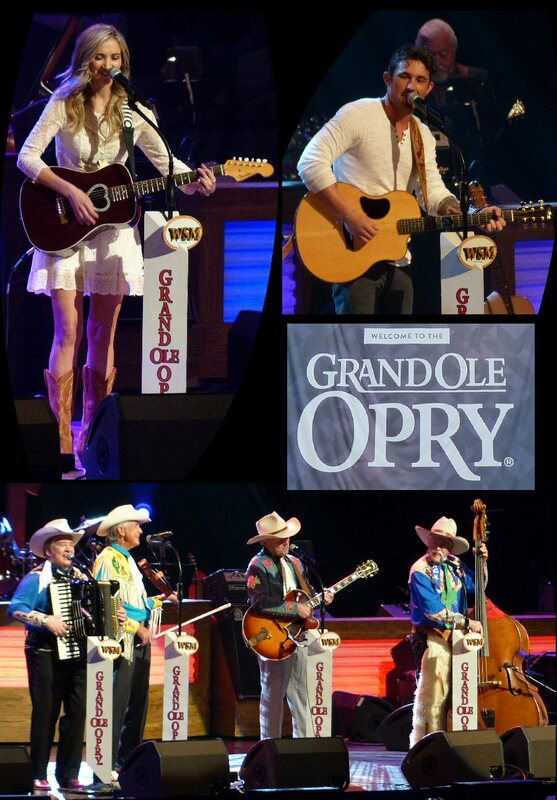 The Tuesday Night Opry radio show was exciting, too. The concert started promptly at 7:00 p.m. with each artist playing three songs. The versatile Grand Ole Opry band filled the stage ready to support the musicians. Also further back but on stage were the family and friends of the artists. The lighting and sound at the Opry is state of the art, yet a barn set design reminds folks that county music has its roots in barn dances that began back in the 1920’s. A flashy dressing room on the backstage tour. The big red curtain goes up and there is Sarah Darling – a country doll with a darling voice. One of the three songs that Sarah shared was about an old T-shirt that incorporated personal storytelling. Riders In The Sky were cowboys armed with instruments. Their voices were magical separately but even better when melded together. They represented old school county both with musical flair and funny moments that included animal noises. Since this was a radio show there were short commercial breaks. We heard the ad for Durango boots a number of times during the concert. The Swon Brothers quickly connected with the Opry fans encouraging them to clap along to their catchy set although they also performed “Pray For You” a more serious and subtle song. Gospel music has also been a long-standing institution of the Opry. The three songs sung a-capella by The McCrary Sisters and The Fairfield Four were spirited and filled with soul. Individually and together they were all amazing singers. Michael Ray – one of country’s newer stars – opened the second set of the Opry radio show. Ray has a deep rich voice more in the vein of traditional country but he could be a rock star the way the girls ran to the front of the stage to take a quick selfie with this handsome, talented singer. His tune “Kiss You in the Morning” was a big hit with audience. Daily and Vincent were a dynamic duo who were strong storytellers and fine singers. Speaking of fine singers, next was Connie Smith who is considered one of the best female vocalist in the genre. She is still an engaging and expressive singer. Since this show was in and around Memorial Day she dedicated “Peace in the Valley” to those who serve. It was a beautiful blend of country and gospel. Dustin Lynch the closer was more of a rocking country artist who slowed it down for the sentimental “Cowboys and Angels”. A song he wrote for his grandparents and sang to a couple at the Opry who were celebrating 60 years together. We thoroughly enjoyed our day & night at the Opry. The “Daytime” Tour was interesting. 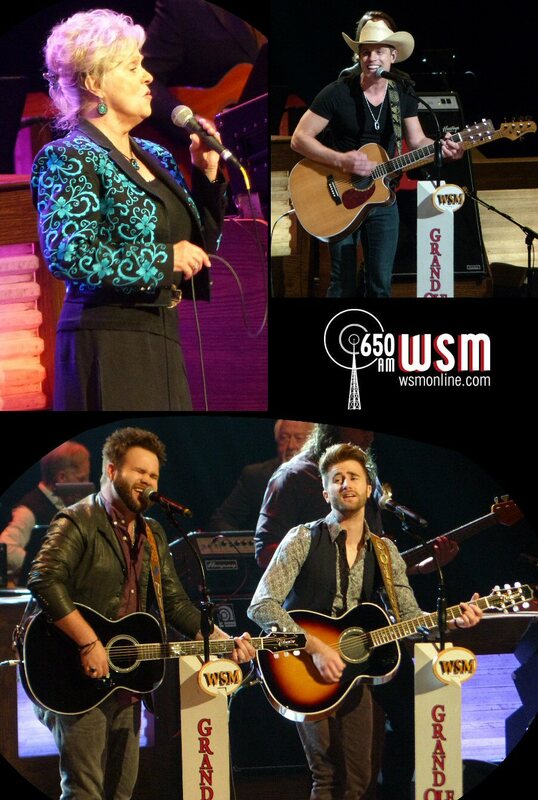 The Grand Ole Opry radio show was diverse featuring comedy, contemporary artists, gospel and traditional country all on one stage in an incredible sounding room that echoes of 90 years of musical history. A view from the stage during the Daytime Tour.